I was so lucky to be a part of this amazing fashion event on Thursday. 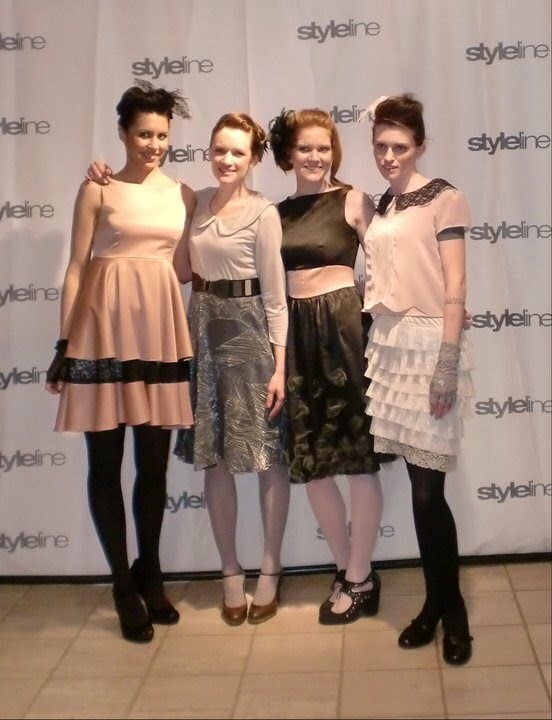 In a nutshell, Art Van & Styleline Magazine teamed together to create a really cool event that featured 8 local designers showcasing 6 looks from their newest collections, when pared with a furniture vignette that reflected their personal style. The audience got the chance to vote on their favorite designer. I was the winner! It was a great honor to be given this award, and the $2000 gift card to Art Van. I was very surprised. The room was filled with so much talent, and I was just happy to be asked to be a part of it. Everyone keeps saying to me, "Aren't you SO happy you won?" and honestly, I don't think I really thought about whether I would win or not win - but mostly I was so concerned with how my collection would be perceived. Let's be honest, my designs don't really fit in with the norm. I have major touches of costume/fantasy and fairytale, and maybe even a dusting of sadness in everything I do. Not everyone understands it, and while I know fashion is a cut throat judgemental business, and you HAVE to have a thick skin - that doesn't mean I want to be made fun of. It is a huge risk to put myself out there, and just to be supported and taken seriously - that was the prize. I have always been a little different from most people I know, and finally it is not a character flaw, but something I can use artistically. Starting a fashion business from the ground up, and slowly, as I enter my 4th year of doing this professionally, it feels so great to be showing my heart to the world and having it be accepted for what it is. Much love to you all.